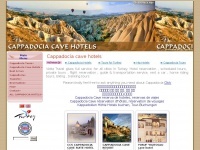 Cappadocia Cave Suites , Yunak Evleri , Alfina , Museum Hotel , Elkep Evi , Ataman , Yusufyigitoglu , Cave hotel , All cave hotels in Cappadocia .We can assist you cave or boutique hotel booking and Tour and transportation organization in Cappadocia. You can book balloon tour , horse riding , regular tours and rent a car. Dyna ��erik Y�netim Sistemi is specified as the websites creator. The web server with the IP-address 74.208.236.164 used by Cavehotels.net is owned by 1&1 Internet and is located in Wayne, USA. There are many websites run by this web server. The operator uses this server for many hosting clients. In total there are at least 131 websites on this server. The language of these websites is mostly english. The websites of Cavehotels.net are hosted by a Apache server and were developed in the programming language PHP. The markup language of the website is HTML 4.0 Transitional. The visitor analysis software Google Analytics is used to analyze the visitors of the websites. Both the inclusion of the website in search engines and follwoing of its hyperlinks is explicitly allowed.